What Are Miles & Home Time REALLY Like with USA Truck? Last time, we talked to USA Truck driver Darnell Rhodes about his CDL training experience (be sure to check out Part 1 of our interview with Darnell if you missed it!) Today, Darnell's going to share some information on his miles, home time, and the importance of maintaining a good relationship with your fleet manager. When it comes down to it, these are some of the most important things to any potential driver regardless of what company they're considering going to work for in their first truck driving job. Pay close attention, because everything works hand-in-hand. The relationship you have with your fleet manager or driver manager can go a long way when it comes to miles and home time. 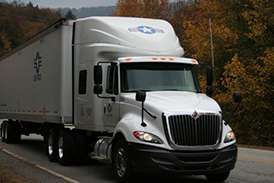 Q: How many miles have you been averaging in your trucking job with USA Truck? A: About 2,700 to 2,800. Some weeks are slower and some weeks are a little bit more. USA Truck runs me hard, I’m not gonna lie. Boy, do they run me! A: I usually get home every 2 weeks. There’s only one time they missed my home time and that’s because of the way freight was running. They couldn’t find anything coming back towards my house. But the rest of the time, every 2 weeks I’ve been home. My fleet manager at USA Truck makes sure I get home when I ask. Q: Can you talk a little bit about your relationship with your fleet manager? A: My fleet manager is the type of person where he’ll bend over backwards for you if you’ll bend over backwards for him. If he gets in a bind and needs you to do something, even though it might be way out of your way, you do it for him because you never know what he might have in store for you. He gave me an extra day off and said that since I helped him, he’d help me out, and since then he’s been piling the miles on me like crazy, all because I helped him out that one time. I think that’s because I met him face to face. It would be a whole lot easier to meet your fleet manager in person because not many drivers do. The ones that do come in, they remember. Then, if something good comes up, you’ll be the first one they ask to do it. Make sure to check back for Part 3 of our interview with Darnell where he discusses how to make a truck your home away from home. Apply Now Fill out our no obligation online application to get on the road to a great new truck driving job! Filling out an application does not commit you to anything, but allows you to schedule a time to speak with a Driver Agent about your career options.